Random | RTB's Blog on Health & Fitness, Travel, Automotive, DIY, Dating & Relationships, Childcare & Education and much more! Winter has finally arrived, and rather suddenly. Halloween 2014 in the UK was the warmest on record, with temperatures in London of 23C. Yet only 6 days later temperatures plummeted to freezing. Thursday morning I was confronted with an iced up car. What I needed was my best winter friend. My leather gloves? Well, they are indeed very handy (no pun intended) in this weather, much more so than woolly gloves, which instantly get wet upon touching the car door handle, and then are rendered useless. Really, what is the point of woolly gloves in the cold and damp UK climate? They always get wet very quickly, and once they are wet, you hands get cold. About as useful as a chocolate fire guard. So yes, I value my leather gloves on a cold morning and I didn’t suffer when opening my car door. My woolly hat? Very useful for me, being bald. Not that I get a cold head – no, my head normally feels ok; but I suffer from Raynaulds syndrome, and when my body temperature drops – without me often realising it and thinking I’m reasonably warm – my fingers and toes turn to ice and go white (post coming up about this soon). Very annoying, not to mention rather uncomfortable. Wearing a woolly hat though seems to stop the heat escaping from my body through the top of my head; my core temperature stays higher and my ‘pinkys’ remain, well, pink. No, my most favourite winter friend is my trusted, rusty old scraper. The best scraper in the world. Well, let’s put it another way – it’s a scraper that actually works. Icy mornings are a pain to all car commuters; first thing in the morning, in the dark, still half asleep, the last thing you want to do is work your way around you car trying to get the ice off. Some people prefer to get in and wait in the car for it to warm up, but this is quite time consuming. Most of us get up as late as we possibly can to ensure we get adequate sleep before setting off for work; we don’t have spare time to be hanging around. I have to get up at 6.30am as it is; I’m not getting up any earlier to sit around in a cold car thankyouverymuch! Many will choose the de-icer spray route. No. I’ll use a scraper. But scrapers are useless. Well, most standard plastic scrapers, that is. They will simply leave two marks on your window where the two far edges scrape a thin sliver of ice off. Rubbish. But I have a superscraper. When I passed my driving test in 1995 at the age of seventeen and my Dad bought me my first car (a bright Orange 1 litre Metro – see my car history), I was also handed his spare scraper. 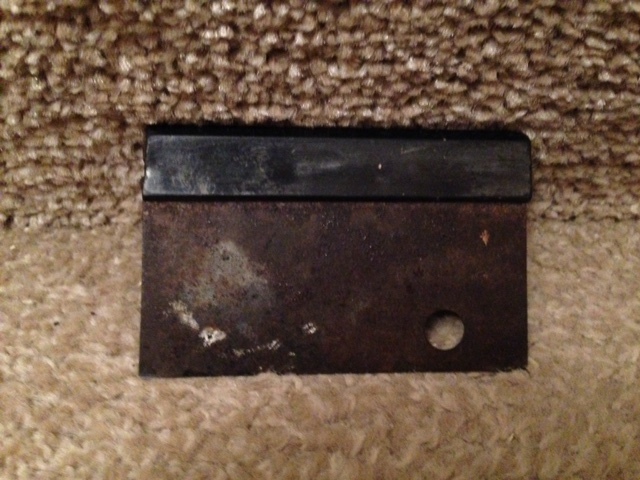 It was a rusty piece of metal with a rubber end. He assured me that I’d apprecriate it when the time comes – and he was right. It’s the only scraper I’ve ever used that actually works. It may sound over the top, but I loved that little scraper. It took seconds to scrape off the ice, and did so in clean, clear sweeps. On the rare occasions I didn’t have it for some reason, and was forced to use a standard plastic scraper, I would dispair. My fingers would be frozen and the view through the windscreen barely adequate to see the road. When I lost it I was gutted. I faced a couple of winters struggling to clear icy windscreens. I tried lots of different plastic scrapers but they were all pratically useless. They’d scrape off only a thin layer; or leave thin trails in the ice; or they would simply snap. I reverted to the de-icer spray, which I hate, as per my above points. When my Dad passed away unexpectedly over a couple of years ago, it took me some time to get over the shock. After some time, we all went through the usual motions, and I agreed to arrange disposing of his car. I found his ice scraper in there. I was happy to share any inheritence and possessions fairly and equally with my brother. Not the scraper – that was mine. So, for the last couple of winters I have laughed in the face of the icy windscreens again. This morning, the first icy windscreen of the season, was no different, and my windows were clear in seconds. I hear now that you can buy ‘better’ scrapers made out of materials other than plastic. I suppose I could try one. But whilst as have ol’ Rusty, I’m quite happy. Here is a beautiful picture of my beloved winter friend for you to drool over. After the disaster of the 24 x 12 foot Intex Ultra Frame Pool I decided to be more realistic. Buying a pool big enough to swim in required far too large a volume of water to heat. In the UK climate, that’s going to be expensive to install or to run. I opted to have something to just cool off in, and forget swimming. I was working somewhere with a gym and pool directly opposite the office, so my swimming urges were satiated. 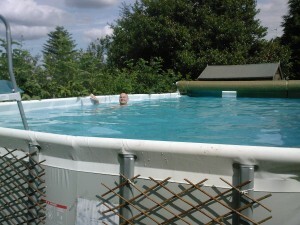 The 10ft Intex Easy Set Pool beckoned me again; I could buy one for only £35 now! (sometimes cheaper to buy for more with a filter pump then separate later). This time though, I’d do it properly. I had a perfect size, level concrete slab patio at the end of my garden, behind the garage. I would utilise a cheap Intex (i.e. same brand – same connections/plumbing!!) pool pump and electric heater which I could power from the garage without any additional electrical requirements. I bought a vinyl pool cover to keep the leaves out. I considered a saltwater chlorination system , but for a pool that size realised it would be easy enough to keep clean using the chemicals and the cover. Of course the cover was rubbish. An 11ft diameter circle of vinyl is bloody tricky to stretch over a 10ft ‘floppy’ pool. Especially when windy. It also kept falling off. When it did stay on, rainwater would build up in huge puddles, stretching and damaging the vinyl. I’d already started building a hexagonal frame around the pool to make it look nicer and to be able to sit on the sides. As I’ve mentioned before, I’m no carpenter; but I was single, working from home often, and had plenty of spare time – so I managed to knock together a suitable frame. With this frame in place I was able to build a two-halves wooden vinyl covered structure as a better pool cover. Well, I’d hoped it would be better. It needed to be light enough to be able to lift on and off easily, yet heavy enough to not be blown about in the wind. The end result just about worked, but again, rain water would build up on the vinyl section and it ended up stretching. The poor joints (hello, not a carpenter!) soon came loose and the frames fell apart. The location of the pool directly below pine trees didn’t help; the pool water got filthy. Build a roof over the pool. At first I envisaged this as a simple four post structure with a sloping plastic roof, something I would build myself. I studied the area and worked out how I could build a stable structure. I couldn’t, really. I would need some more solid walls. Then I thought to myself, why not enclose the whole pool, and build a greenhouse around it? 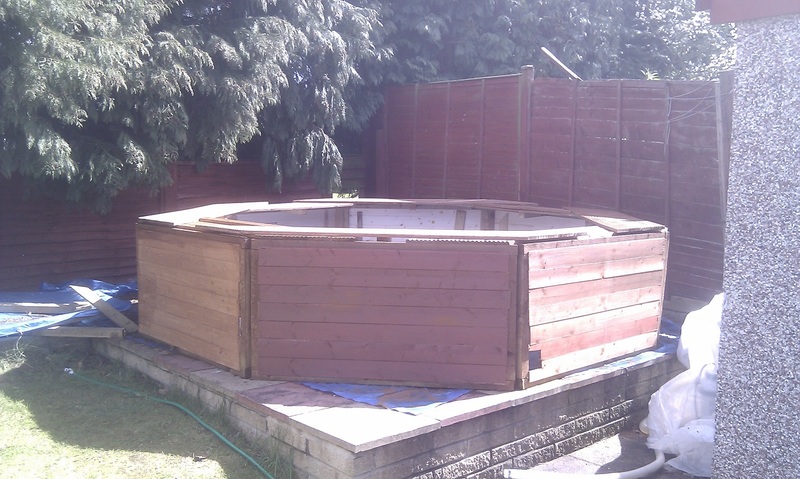 I’d already had the idea of filling the gaps between the wooden shell and the pool with insulation to help prevent heat loss; putting the whole pool in a greenhouse would actually help heat the pool! greenhouses would also be too small to accommodate it. It would need a sturdier, larger solution – more like a conservatory. Here I stopped myself. 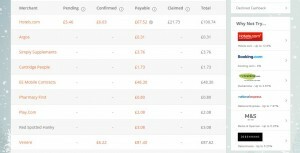 Costs were spiralling! I considered a plastic/perspect type conservatory/greenhouse. But that would look naff. So I decided to build a wooden framed enclosure with several windows and a glass roof that could open when it got too warm. This was way beyond my abilities so I got in three tradespeople to quote building a large ‘shed’ around the pool. 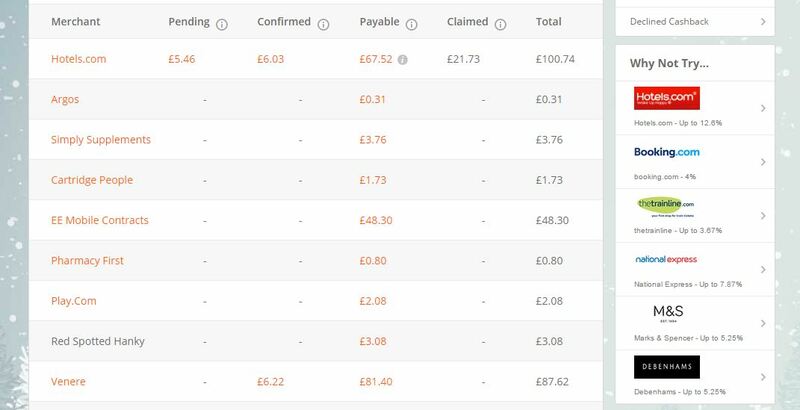 The first two guys quoted around £1500-£2000 which was way beyond what I’d hoped to pay. using corrugated plastic rather than glass in the windows and roof. I was quite disappointed with the result though and perhaps shouldn’t have gone for the cheapest option. The windows look a bit, well, crappy, in corrugated plastic. You can’t see through them properly and they don’t have the same heating ability of glass. They were also far too small. The “pool house” (ooo, fancy) was a bit dark – I’d imagined a light and airy enclosure. The roof window was also really difficult to open, and only opened a fraction. However, the principle issue of keeping the leaves and flies out was solved! I don’t know if I have suicidal or accident prone spiders in my garden, but the number of dead spiders I find in my pool is disturbing. I regularly have to fish them out with a net; actually my daughter quite enjoys helping me with this! 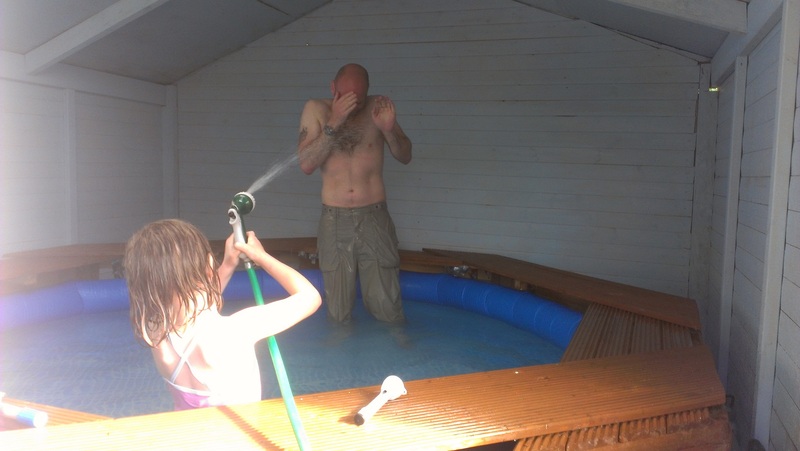 The heating was vastly improved too now; and late in the summer of 2012 my daughter and I enjoyed several days splashing around in the pool. The next summer though I hardly used the pool. Quite a few reasons… it wasn’t a great summer; if there were hot, dry days then they usually weren’t in sequence, so the pool hadn’t time to heat up enough… and those days spent with my daughter we spent on days out, making the most of the weather. I was single/dating and kept busy for the rest of the weekend and the evenings. Even though I worked from home a couple of days a week, I was busy with other projects. I also went on holiday a lot that year. Later, I painted the interior a light blue to brighten it up. However, the moisture built up and black and green mould started to grow on the ceiling. A lot of scrubbing and effort later, I managed to clean it up and re-painted it, mixing in an anti-mould paint additive. It didn’t work too well though, so I now leave the windows open to reduce moisture build up. This is of course means though that the heat doesn’t build up, and on those odd days I think “let’s use the pool!“, it’s not warm enough. We come to the present day and I still have my “pool house” and it’s collection of cobwebs and dead spiders. The roof now leaks from rain, although that’s not a major concern. However the lack of light and general gloominess makes it rather undesirable. This spring, I spent several weeks searching for a company that could fit a new, slide to open, glass roof. Such a company doesn’t seem to exist. Several glazers, shed companies and other random tradespeople refused even to come and have a look at it. “Ooo that’s not something we do“. So I started looking for a sliding window frame – such as many be fitted in a loft or top floor apartment, with the idea of purchasing one and getting a local builder to fit it. Most of the designs are electric powered sliding systems for luxury homes. It was very hard to find a simple manual slide open window of a suitable size, and even that wasn’t cheap. The best solution I could find was 1960s VW campervan sliding window!! But they were a little small and how the hell would I fit them to the ceiling? The madness had to stop. I have left the pool house as it is. We have hardly used it this summer. We have had many days in a row that have been sufficiently warm to use it, but again, have been busy with other projects. We managed to take quite a few weekends away, so have fulfilled our swimming pool urges for this year. Last month the weather was hot and my daughter was with me and asked if we could use the pool. I’d recently bought a saltwater chlorination system (the idea being if we’d got a proper glass roof, we could dual up it’s role as a greenhouse and grow tomatoes, and I didn’t want chlorine and other chemicals in the air around the plants) so the pool water was constantly clean and she was convinced the water was warm enough. I wasn’t. So I kept my t-shirt and shorts on and she happily splashed around for 10 minutes or so. Splashing me in the process of course, and I got cold and came out. I asked if she was cold and she denied it, but 5 minutes later I saw her teeth chattering so fished her out. So what does the future hold for my pool house? At this stage, I don’t think it’s worth spending money on. We’re not using it often enough. If we can find a cheap glass roof solution and double up it’s purpose as a greenhouse, that would be a good way to go. But we’d need someone to fit it, and fit a new door, as access to the plants would be impractical in the current set up. So it’s more money. I’d rather spend the money to go on holiday and use a real pool. My god! Am I becoming sane in my old age?! 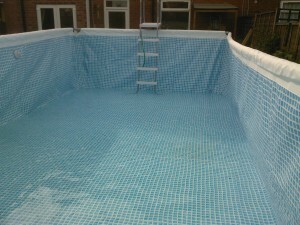 In the spring of 2008 I had carried out almost a years worth of research on home swimming pools and had purchased what I believedto be the perfect solution for only £800: A 24ft x 12ft Intex Ultra Frame Pool . Although of course, it cost a lot more than that. I needed a filter pump to keep it clean. The cheapest with a suitable flow rate was a sand filter pump for £300. The sand itself cost another £55. I figured having lights in the pool would be great for the evening – they set me back another £200. Then there was a cover to consider; I wanted to keep the leaves out. I bought a huge roller and solar bubble cover. The idea was that with the cover on, the sun heated the air bubbles on the cover which in result heats the pool slightly. Getting a 24x12ft cover off the pool manually would be a pain, hence the roller system. Keeping leaves off would only be half the problem. I still had to maintain the water cleansliness. I could do this through the use of water tester strips to check ph and other important levels and then add the relevant chemicals and consult online charts. There was a whole science to this and I spent many hours studying the complexities. I eventually found out about something called a saltwater chlorinator system that sounded much easier, but decided to cut the spending for now and maybe purchase later if it became too much to manage. An additional cost was the levelling of the garden. Recalling the large effect even a slight incline had made on a relatively small pool, I realised that a level surface would be critical to a pool of this size. We drafted in a couple of guys for a day to level off the garden and lay a solid sand base, and take away the excess earth. I can’t recall how much this cost, but I don’t believe it was as cheap as I would have liked. So what else did I need to spend money on? operate outdoors. A suitable panel was bought at cost of something horrendous like £500 if I recall correctly, and then I had to pay for the electrician to fit it. The critical element to the whole picture. How was I going to heat a 24 x 12ft 32,000l (7000 UK gallons) pool? Well, I’d done my research. Electric heaters were the simple option, but only really worked for smaller pools. They were cheap to buy, but the heat output was minimal, and they cost a fortune to run. Gas heaters were the supreme option. These heated up a pool the quickest and were more efficient to run. But the outright purchase cost of these were extortionate. Surely there was a middle ground? Enter the wondrous technological miracle that is the Heat Pump . A heat pump works in the opposite way to a fridge. Instead of using electricity to turn outside warm air into cold air, it turns outside cold air into warm air. technology had been adopted for swimming pool heaters, particularly in Canada. The heat pump used a measly amount of electricity so was incredibly cheap to run. However, it also output a measly amount of heat. The idea was that you would leave it running constantly and it would gradually heat up your pool. Sounded like the solution for me. Some of them though were as costly as gas heater. However, after much digging, I eventually found a suitable heat pump for £1500 (they’re cheaper these days, see here ). Ok, it was twice as much as the pool itself cost. But it was the best solution; and the total cost of my purchases was around three and a half grand – surely you couldn’t buy a complete pool solution with heater, that size, for any less? That’s because my solution didn’t work. I’d saved huge costs by shopping around, buying different parts from different suppliers. It seemed the Americans, Europeans and Chinese all used different sized pipes and plumbing fittings. I spent another small fortune on pipes and connectors, trying to piece the giant puzzle together. I’d figure I’d need one part and order it, only for it to arrive a week later to find that it didn’t fit after all or I would need an additional part for it to work. Eventually, I bolted, screwed, glued and jammed all the equipment and plastic piping together. I’d even had to build a small shed to house the pump and heating systems, as a lean-to at the back of the house. If the ugly grey vinyl monstrosity of a pool in the back garden wasn’t exactly a pretty sight, then my lean-to shed, also visible from the kitchen window, wasn’t helping matters. I started to fill the pool. 37 hours later (yes, that’s right, thirty-seven hours) the pool was more or less full. I opened the values to let the water flow through the pipework to the pump and heater. And closed them again immediately after being sprayed with water from (several) leaks. After repairing the leaks, I tried again. The leaks weren’t so bad this time, but they were still present, and at multiple junctures. The sheer volume and pressure of the water was too much for my bodge job piping to cope with. The leaks were significant enough to not be able to run the system; too much water would be lost over time and air bubbles in the pump could also cause damage. I had to repair the leaks. Usually the bodge job fittings I’d made were from parts sourced from eBay and B&Q plumbing spares. All attempts over the next few weeks failed; I couldn’t fix the leaks using these solutions. I had to go to the Australian Navy! Well, not literally. But I found a product that they used to fix leaks in their ships. It was a resin soaked bandage that you wrapped around the leak, soaked with water, waited, and it set hard. It wasn’t cheap but I had ran out of options. At this stage, I was getting somewhat stressed. Spring had passed and we were in the critical summer period. Also, I hadn’t had time to attempt any ‘camouflage’ to make the pool look better and the missus wasn’t happy with the ugly beast ruining her view. Worse still, I was spending so much time on the pool I wasn’t helping as much as I should with the baby either. This solution had to work. Well… it worked on some of the fittings. In places it dribbled at a rate I could ignore; in some places I had to redesign it completely and buy new piping and re-glue. If I ever get offered a ride in an Australian Navy boat though, I’ll give it a miss. 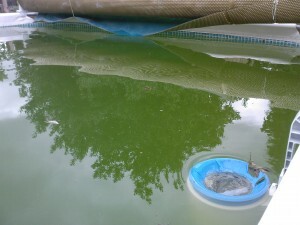 Unable to run the pump to mix chemicals, the pool had gone green by this stage. In July I’d decided to purchase the saltwater chlorination system as opposed to using chemicals; the idea is that an electric current passes through an electrolytic cell, electrifying the salt water to turn salt in your water (at a concentration much less than sea salt and barely tastable) into chlorine. Salt is composed of sodium and chlorine; by passing a current through it the salt temporarily breaks down into chlorine (and sodium); thus cleaning the water passing through; before turning back to saltwater. Except this had further complicated my pipework and I couldn’t run it until the pipework was sorted! By the time I got the plumbing (more or less) fixed and I was able to run the system and clean the water, summer had passed. I tried to use the heat pump but it was autumn and she didn’t seem up to the job; it was barely raising the temperature by a degree or two. Dejected, I waited for the next season to be able to use my pool. Meanwhile, I’d been trying to make the pool ‘prettier’. The original plan had been to build an edging around 50cm deep at the height of the pool all around it on which you could sit and dangle your feet in. This was beyond my carpentry skills though. The next idea was more along the idea of fence panelling. It would border the entire pool to mask the vinyl sides, and have a small overhang to hide the top rim of the pool. Again, it looked tricky or expensive to do, and winter was coming. The wife at the time, desperate to make the most of a bad situation, had a solution. We could lay (relatively cheap) trellis panels on the metal side supports and plant creepers that would grow up the sides of them, masking a significant part of the pool to merge it more into the green garden. Good idea in theory, but the creepers took forever to grow, and in some cases, didn’t grow at all. 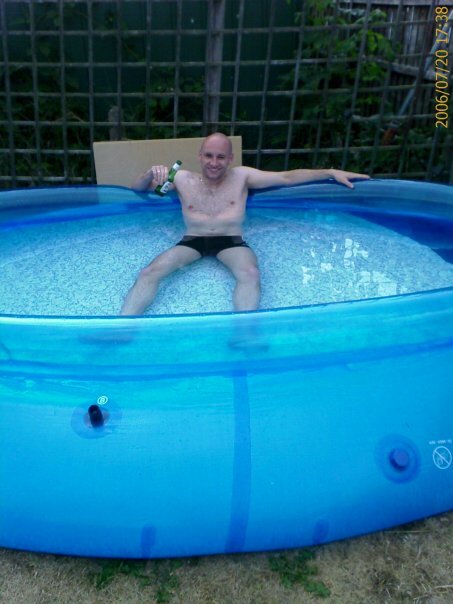 Spring 2009 came around and I was desperate to try my over sized paddling pool. I fired up the heat pump and watched the temperature climb. One spring day, the temperature outside reached 25 degrees celsius. A lovely day for a dip! Not in my pool it wasn’t. It was far too cold still. Was I doing something wrong with the heat pump? No, it all looked good… I could feel that some warmer water was coming out of it… but it didn’t seem to be able to cope; especially overnight. I’d loose the vast majority of any heat gained. I kept my solar cover on, but this didn’t help with the heat loss. On sunny days, I’d lift the cover and put my fingers in the pool, to find the water a lovely warm temperature. For the first two centimeters. Dipping my hand lower resulted in a cold shock. 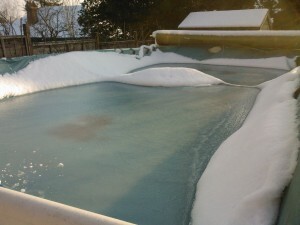 The cover was only warming the very top layer of water and the main pool water was still very cold. It was then I realised my mistake. Heat pumps are designed for in-ground pools. All my heat was escaping through the thin vinyl sides of the pool. The heat pump was doing its job correctly; using minimal electricity and topping up the pool temperature by about 1 or 2 degrees daily. Through the night though, it was unable to contest with the cold spring temperatures and the heat loss though the sides of the pool. Would it cope in summer? Thankfully, it did. The summer weather heated the pool water and the evenings became milder; the heat pump was just about able to fight off the heat loss. The water temperature rose to a pleasant, even warm, level! I was able to swim!! Finally enjoying a swim in my own pool! one end to the other before having to turn around was just about long enough to have a good 20 minutes blast of solid swimming in. My Dad came round as soon as he heard the good news, and was in the pool before I’d even had the chance to say “come on in, the water’s lovely”. Being 12ft wide, there was room for us to both swim side by side. I was living the dream! I had my own swimming pool in my back garden!! I tried my original plan of waking up and having a swim before work. It was only just bearable though on the warmest days. A swim after work was better but again it had to be a significantly hot day and the sun still out. I worked from home occasionally for a period at that point; this was ideal. At lunch time I’d go straight outside and spend an hour in the pool. The heat pump couldn’t cope with the quickly cooling evenings, and the water became too cold for me to swim. Summer 2008 has presented Europe with an economic crash. My contract had ended and wasn’t renewed; I had been out of work for 5 months, finally getting a new permanent job in February 2009. It didn’t pay as well as contracting though, and the bills had mounted from the 5 months I’d been out of work. Then we decided to move house. The pool had to go. I’d considered trying to take it apart and transport to the next house, but the wife wouldn’t hear about it. It just wasn’t practical, and it was a waste of money. Couldn’t we sell the damn thing? At first I dismissed the thought: how could I sell my rather dodgy bespoke above ground pool system? The best bet was to just sell it with the house. The estate agent though decided that it wouldn’t increase the value of the house at all. In fact, it may put people off. So I figured I’d try selling it on eBay. Someone bought it, and took the entire system back to Yorkshire with him. He didn’t pay much more it in the end; yet I bet he’s still cursing me for buying such a contraption. The question in my mind though was: how do I install a cheap but optimal pool system in the next house? My obsession was rudely interrupted by the break up of my marriage. I’m not going to discuss such a personal thing as my separation and eventual divorce on here, and the reasons leading to it, but I’m pretty sure my pool obsession hadn’t helped matters. that she was actually probably right. That’s when I was forced to reinvent myself – but that’s an entirely different story! I lived with my Dad for a year before buying my own house. 2 years later and several dry hot summers passed; I needed a pool again. A midlife crisis during 2008 resulted in me erecting a 24 foot by 12 foot 32,000 litres (7000 UK gallons) swimming pool in my back garden, causing endless expenditure of money and stress. My obsession started in, I believe, 2006. The summer was hot and dry and I longed to cool off in the sea or a pool. We tried to go away to the coast at the weekends, but we were either busy, or the weather was happened to be bad the times we were free, or at the coast. I sat in our spacious back garden sweltering in the sun one evening thinking that I just needed to dip my feet in some cool water. The idea of bringing out a washing up basin to put my feet into popped into my head. This brought back childhood memories of padding pools. Why didn’t I buy a paddling pool? Because they were for children… I need something bigger. I needed an adult sized paddling pool. I then had a flashback of something I’d seen on one of the ‘toys for boys’ type websites I’d been looking at the previous Christmas to buy my brother and Dad something suitable; I’d seen an adult sized paddling pool. 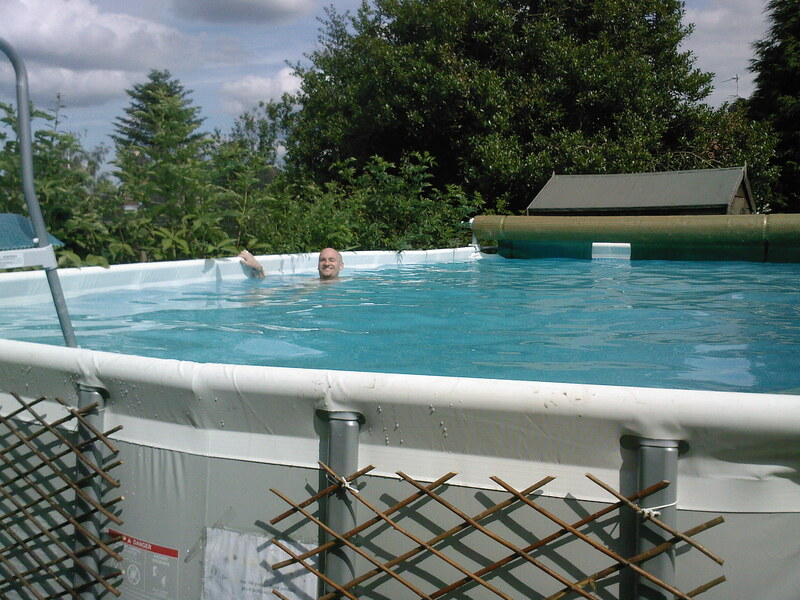 I ran inside and checked the web; yes, you could buy a 10 foot diameter pool for your garden for only £50! 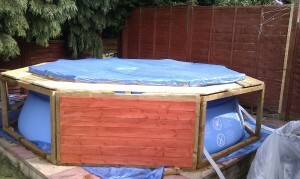 Said pool was duly ordered and delivered only a couple of days later. I unpacked my Intex Easy Set 10 foot paddling pool and followed the instructions on how to inflate and fill. Ok, it needs to be on a flat surface… that’s fairly obvious I guess. I decided my lawn would do the job nicely. I found the flatest area, spread the pool out, inflated the sides and fetched the hose. 2 hours later it looked rather disappointing; I had a floppy looking vinyl ring with a small puddle in it. It seems that 2500 litres (550 UK gallons) of water is actually quite a lot of water, and my garden hose was failing to deliver it in a timely manner. I did a quick calculation of how much time the hose had been running and how full it was so far and decided it was safe to leave on overnight. The next morning I got up and got ready for work, and checked the pool before I left. It was looking better… but rather lopsided. The inflatable top ring hadn’t taken much effect until more water had filled out the sides and was now taking on some shape, but at a sickening looking angle. One vinyl side looked quite solid and the other was still very floppy looking; it seems that my lawn wasn’t quite as flat as I had hoped. I had to get to work though so I switched off the hose and headed off, eager for the day to pass quickly so I could play with my new toy. As soon as I got home I took a better look at the pool. It was decidedly wonky. The almost imperceptible slope of the garden was significantly visible when such volumes of water are involved. It didn’t look good. Still, it could be filled further, so I hoped it may straighten out a bit. What worried me though was the wrinkles and creases on the base of the pool. You were supposed to keep straightening it out by pulling the sides and standing in the pool to smooth them out whilst filling. I’d been pulling the sides during the first few hours of filling but it had been a bit chilly that evening so I’d not fancied getting in it. After the overnight filling, it was now too heavy to move the sides by pulling them, so I took of my shoes and socks, rolled up my jeans and jumped in. Sheesh that was cold. Had I added ice or something? straightening it. Oh well; it would be fine. I continued to fill it for a few more hours. It looked rather poorly. The volume of water pushed against one side so much that it lifted the inflatable top ring from the other side at a drunken looking angle. But that didn’t matter. I now had a pool! I took a photo and showed my work colleagues who nicknamed her ‘The Beast‘. I waited eagerly for the hot weekend. Of course, that weekend wasn’t so hot. It was pleasant enough, but hopping in the pool even with shorts and a t-shirt on was pretty cold. 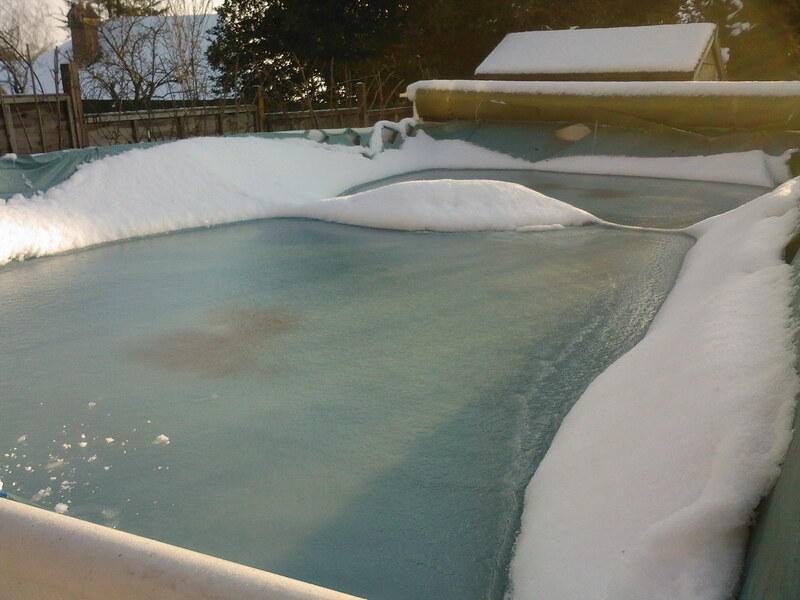 A week passed, and the pool started to look rather dejected. Leaves and dead flies floated in the cold waters. The weekend passed and we didn’t use it. By the middle of the next week, the water was starting to go green. I’d read about pool maintenance; the use of chlorine and ideally a pool pump. It seems I could skimp on all that and just use bleach; but I was a bit scared of getting it wrong. I decided that the best option was to start again. land as best as we could. As the pool was filled, we stretched and pulled and smoothed the bottom all weekend long. The end result was much better; although admittedly the pool still had a distinct lean to one side. A hot day came and we were just about able to bear sitting down in the pool; it was bloody freezing though. kettle/saucepan was a joke; the volume of hot water to cold water was so insignificant as to have no effect whatsoever. However, we then proceeded to have several hot days one after another. The pool water began to warm up. One balmy night, we invited our neighbours over to join us for a few drinks on our newly constructed patio (which also had a distinctive lean to one side… perhaps me and my mate shouldn’t have drank 20 cans of beer between us whilst building it…?). A few drinks quickly descended into, how would I put it, ‘a right royal piss up?‘. My wife at the time, the neighbour, her daughter & her boyfriend, and I, all ended up in the pool. probably spent an hour or two in there. That was the last time we’d use it. The water went green a few days later and I emptied the pool ready for the next warm spell. We didn’t have one that year. By summer 2007 we had moved house and every spare moment at home was spent renovating our new house. The pace had to be picked up when we learned that a baby was on our way. The old pool had become mouldy and spider infested over the autumn/winter and we had decided to throw it away during the house move. We were so busy that there would have been no time to use one anyway. But the idea had not gone from my head. In my spare time when I wasn’t decorating, I was on the internet, researching swimming pools. My ideas were grander. I was earning good money at work. 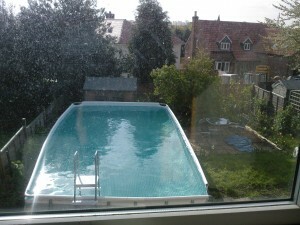 Could I fit a proper swimming pool in my back garden?? A ‘proper’ swimming pool was going to cost at least £25,000. I couldn’t afford that. Well, perhaps I could, if I saved hard… but a baby was on the way, and was a pool really practical in England, with all the rain and cold weather? wanted to be able to swim!! into scuba driving, and had been keen to get my brother and I into swimming at an early age. I admit that I didn’t take to the water immediately; as a young child I was terrified and hated water in my eyes, whereas my younger brother took to it like a fish. Eventually I overcame my fears and genuinely thank my father for getting me into the joy of water. One of the most joyous moments in my life was this summer when I swam in the sea with my own daughter for the first time. Since my teenage years, wherever I found water, I would swim in it: sea, lakes, rivers. Although I’m a bit put off rivers after the water snakes in Italy… but that’s other story. in my own back garden, every day, that would be worth it for the health benefit alone, right? The wife wasn’t so convinced. We certainly couldn’t justify spending £25,000. So I went back to the research. It seemed you could buy bigger versions of the ‘adult sized padding pool’ in which I could potentially swim. They all looked ‘floppy’ or naff though and still weren’t ‘proper’ pools. One of the main problems with ‘in ground pools’ is the sheer volume of earth that has to be dug up and removed. Apparently this is very time consuming and is one of the main expenses. Problem was, they still cost around £10,000 – £15,000. I eventually found some in the £5000 – £8000 range which I seriously considered. The main issues were that these were round in shape. This meant that unless I bought a significantly large one, I wouldn’t practically be able to swim in it. I needed a long, thin pool. We were also planning the layout of our new garden and a round pool didn’t fit conveniently. What if I could find a suitable vinyl sided pool (ugly) but build a wooden frame around it? I eventually stumbled back across the 24ft x 12ft Intex Ultra Frame Pool . It was a good size too: 24 foot (7.3m) long and 52 inches (1.3m) deep meant I could actually swim: once she was up and running I was able to do a good 7 breast strokes from one end to the other before having to turn around. It was rectangular, thin and long, so could fit in the garden well – just. In March 2008 I made the purchase, having found it at a reduced price of £800. In the modern office environment, individuals have many ways of communicating with one another. Getting together for a meeting in a dedicated room or an informal chat in the canteen, whether it’s 3 of you or 30. Written letters and memos aren’t really used any more, but sometimes you might print some details or notes off and put it on your colleagues desk for them to read. Or occasionally you may throw a paper plane at a colleague. Air mail! In the last few years, the practice of teleconferencing (or videoconferencing) has become more and more popular. The idea is that you dial a teleconferencing facilty number, enter a pin code for that meeting, and then everyone can talk to each other. There are numerous problems. For a start, if everyone is in the same office, then there’s no point using it – you may as well just all meet up somewhere. So it’s more for cross office use. That’s when things go wrong. It’s usually x amount of people from one office, and maybe one person or a small group from other office or company. The first group will normally sit in a meeting room huddled around a desk with a teleconference device in the middle of the room. The device has multiple microphones to pick up everyones voice. And sniffles. And coughs. And grunts. Not to mention the general background interference. If just an individual is calling in from other office on a single telephone line, then they can be heard reasonably well over the teleconferencing devices speaker. The caller won’t be able to hear the group of people in the meeting room very well though. Especially if they start debating things between themselves and they forget to lean forward into the device. If two groups of people are using teleconferencing devices then it’s far worse. The background interference makes it very difficult to hear, even with modern VOIP technology. Get more than two groups together – and it’s hopeless. Then there’s the lack of eye contact. In a normal face to face meeting, you make eye contact, or pick up on other visual clues, that someone is about to finish talking, or someone else is about to respond. Email and IM (instant messaging) have their own rules too; questions are asked and responses recieved, information flows. Teleconferences, unless well managed by a chairman, are a mess. Without visual contact, it’s hard to tell when someone is about to finish speaking, or someone is about to respond. People usually end up interupting each other. Often someone will start talking, not realising that the previous speaker hasn’t finished or that someone else has started talking, the poor sound quality often not helping. Then follows a muddle of apologies and ‘oh, sorry, no, you talk‘ and ‘no, you talk‘ – resulting in a stall – without visual contact, the usual conversational cues are gone. Videoconferencing may solve some of these visual issues but in practice is rarely used; many individuals may be travelling, working from home or in some other way are without video conferencing facilities. There’s the speakers that forget to turn off the mute and everyone listens to their silence. And the ones that speak in a weary monotone and send you to sleep. There’s the one who shouts down the phone deafeningly, or the quiet mumbling girl you can’t quite hear. Or the guy calling in from the busy train station, and all you can really hear is that the 3.29 from Colchester has arrived. And how do you know who’s talking? In larger organisations you often haven’t met the speaker, let alone know what his voice sounds like. In well organised conference calls, the speaker, or chairman, will announce who is who but this only tends to be in the first few minutes; after a while it becomes quite unclear who is speaking, and to whom, especially if individual speakers are from a similar region and don’t have distinguishable accents. On the subject of accents lies yet another problem. I’ve endured many tiresome conference calls listening to delegates from various parts of the UK struggling to interpret their different accents over the airwaves, mingled with participants from India, Spain, Malaysia and Hungary. Many of those international individuals speak excellent English. And even those that do tend to have strong accents. Face to face, you can often understand. Technical conference calls in particular make no sense. When you’re talking about technical terms, parameter values, table or program names, you need very precise information. Surely a written exchange of information would be more appropriate – anyone heard of email? Teleconferences also tend to descend into arguments. If the topic is somewhat debated, and there are defensive arguments, things can be misheard, and the regular interruptions due to the lack of usual conversational cues lead to irritation. Most teleconferences I’ve been on with more than five or six people and multiple teams descend into shouting matches. Then there’s the dozers. Those that only need to be in on the call to comment on one or two things, or if a particular subject arises. They wait patiently in the hour long call, with the droning of others on topics of no relevance or interest to them causing them to enter a sleepy doze. When they are finally called upon they have to snap out of their doze and there’s the inevitable delay whilst they ask for the question to be repeated and then awkwardly ask leading questions to try and obtain the important information they missed over the last 10 minutes. That’s the other issue with teleconferences – the attendees. Quite often it seems that every man and his dog has been invited. On a large project, there may be two or three separate companies involved, with several different teams each. Teleconferences often have more than twenty attendees or more, with half of them not really required. I have sat in several two hour long conference calls where 95% of the call has been completely irrelevant and meaningless to me, with me called on to answer only one related technical question. Which could have been emailed to me after the conference call, or, more often than not, even beforehand. What a waste of time and resource. I thought these meetings were supposed to save time? I can quite understand the benefits of a large group of people from multiple locations meeting over the airwaves rather than in person. The logistics, travel, fuel and potentially accommodation costs of getting together multinational attendees can be huge. The question that needs to be asked though, and never seems to be these days is: do we really need to get all these people on one call together for 2 hours? Could we just get the project manager and the three head technical guys from each team on a call together perhaps for 10 minutes to establish what is really required, and then set up another call instead, or perhaps the technical information can be established via a quick email to the relevant parties? There seems to be a habit these days of having long teleconference calls with someone from every team involved just for the sake of it. 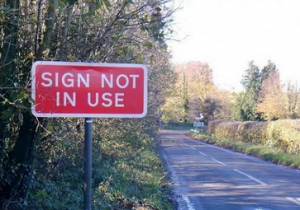 These often seem to be organised by so called Project Managers and hilariously titled Service Delivery Managers (okay, I won’t pick on every PM and SDM but some of them – really? What do they actually DO?) who often don’t understand a technical project from even a basic technical level – so don’t actually know who to invite. So I can’t blame them, but I think that they should consider contacting just a handful of individuals first to establish what actually is required and who needs to be involved, rather than lazily inviting everyone. Another even more annoying use of teleconferences is to manage a crisis. In the wonderful world of IT, things break. Most problems occur because someone changed something, somewhere, without telling someone. Management’s approach is to get everyone together immediately on a call so that the relevant teams are involved and can engage collaboratively. If there’s an urgent IT problem, the relevant teams need to spend their time looking at the problem urgently. Those teams know if they are the relevant team for that particular problem – it’s their job to do so. They don’t need to waste their time dialing into a conference call with PMs, SDMs and other random management teams with nothing better to do asking them for updates and the ‘root cause’. Let the technical teams get on with it. It it’s not clear which team the problem lies with, get the other teams to investigate too. If the issue lies somewhere between the two teams, they can communicate with each other – they don’t need the SDMs “help”, and they certainly don’t need a teleconference call. How can they spend their time technically investigating a problem if they are on a phone call? They need to concentrate on the issue at hand. So, if you’re about to schedule a teleconference call – please, think about the alternative options first. No, not the one Neo dealt with. 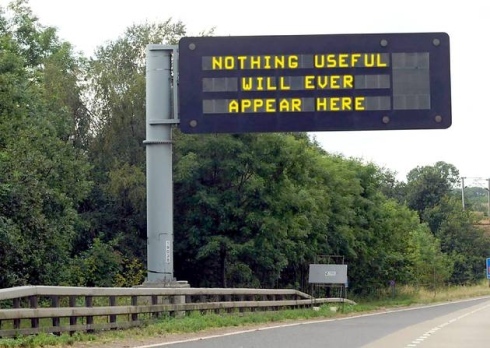 I’m talking about motorway matrix signs. idea is to aid traffic flow and reduce congestion. case is true in many other areas. The idea is that traffic flow is monitored and when congestion starts to occur further on ahead, matrix signs suggest a reduced speed before the affected area. In theory, approaching traffic will slow down and by the time they reach the troubled area, the congestion ahead will be eased. One problem is down to the way it is managed. There is often a delay before the message is displayed, by which time the congestion has already eased – so traffic at one point in the flow slows down unnecessarily. Which can then cause congestion behind it. congestion has already been reached; or even too early: so drivers become frustrated at the reduced speed and ignore it anyway. lane doing somewhere between 75 and 90mph – chaos ensures. hand lane ahead is clear, so increases his 80mph speed to overtake the ‘fools’ in the middle lane. front, decides his only option is to move into the fast lane – straight into the path of the accelerating Driver B.
times. Drivers panic and slow down abruptly, whilst others choose to ignore it – they don’t want to be told by computers to slow down because of something ahead that they can’t even see – they will make the decision using their own brains thank you very much! And there’s those drivers that have experienced the early/late/outdated matrix warnings as I’ve outlined above previously and take the message with a pinch of salt. So they don’t work. And in the extreme cases as highlighted above, can be dangerous. As my esteemed ex-colleague Dave (AKA “MR GRUMP“) would say, matrix signs are “self-prophesying”. Admittedly, they can be useful. Messages that display that a junction or road ahead is closed is useful and can allow you to plan ahead. forgetting that they are on a motorway, and drift from their lanes or fail to notice the vehicle in front of them slowing down. For many, they are a dangerous distraction. Especially when the message is obscure, irrelevant, or downright stupid – which is often the case. Ok. I won’t. But don’t put this on roadside sign where people are passing at 70mph. It’s distracting, and pointless, as people generally aren’t littering whilst driving down a motorway. And those that do are hardly likely to respond to it. There’s another variant I’ve seen on this: “Bin your litter: Other people do“. Sheesh – way to put me on a guilt trip! I’m sure I learnt that when I was doing my driving test. Actually, I learnt it as a small child. I don’t need a a matrix sign to tell me that, thank you. Oh ok. When they’re back off strike, I’ll drive like an idiot. Erm. Ok. I will. Thanks. problem. In this case, they actually create them. Hi everyone – well, this is my new blog, and my first post. So who am I, and what’s this all about? I’m a 36 year old father of a beautiful 6 year old daughter and have been working in the IT industry since graduating from University in 2000. I’m open minded and outgoing, love to travel, and have been lucky to experience many different aspects of life. The idea is to share the ‘wisdom’ I’ve learnt over the last few decades on a variety of subjects, such as Health & Fitness, Travel, the Automotive world and my obsession with cars, along with a few tips I’ve discovered in other areas, such as DIY, childcare, and to offer advice & opinions on many varying subjects, such as saving money; for example, by using the TopCashBack site I’ve literally saved myself over a thousand pounds over the last few years. These are all my own opinions based on my personal experience and I don’t expect everyone to agree with everything I say, but hopefully you find something useful or at least mildly entertaining.